Retail Price: $45.00 Log in for LOWEST PRICE! Maldonado is one of those feel-good stories you never get tired of hearing. In 1970 Lupe Maldonado came to the Napa Valley from a small farming community in Mexico. He began working at Sterling Vineyards. He was so good at farming that he began to get offers from all over the valley. One was from Peter Newton, when he was forming Newton Winery, and that offer was too good to pass up. Lupe became the vineyard manager there and continued for 30 years until his son, Hugo, succeeded him. Lupe didn't stop there. He bought a 10-acre parcel in Napa and did what he did best: he planted grapes. He established his own farming company and, in 2007, broke ground to build their very own winery. And, they did it almost entirely by themselves. They drilled their own caves and removed ton after ton of dirt and rock. Then they poured the cement and installed the plumbing and electricity. In other words, the Maldonado Family put a new spin on the word "dedication". 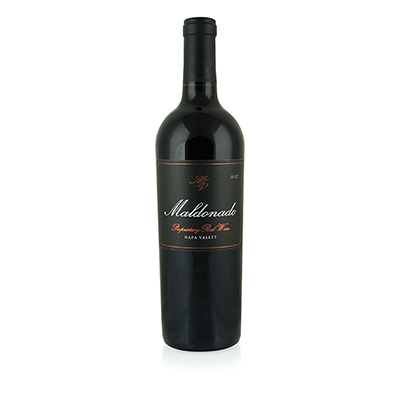 Our selection is a blend of 65% Cabernet Sauvignon, 20% Merlot and 15% Syrah. All are grown in Napa Valley. The result is a richly textured and compact wine with each grape delivering its individual flavors and character but none taking over and dominating the others. The Cabernet and Merlot play beautifully together, with rich cassis and plum notes, while the Syrah adds earthy components, a touch of spice and a full, wonderfully grand finish.